Recently I received a very moving letter from Shirley Baker (May 2006) . This letter which I will display in full was written to her grandmother in June, 1917 and was from Hazel Yeo of St Thomas, Ontario. Shirley's grandmother, Mable Jones was Lloyd's fiancee and the letter was in response to the death of Lloyd Garfield, from a sister to a betrothed, what a loss. Shirley discovered the letter in 1979 after her own mother's death and is now anxious to try and find any of Lloyd's relations incase they may have other letters, such as ones from her grandmother and also a photograph of Lloyd. 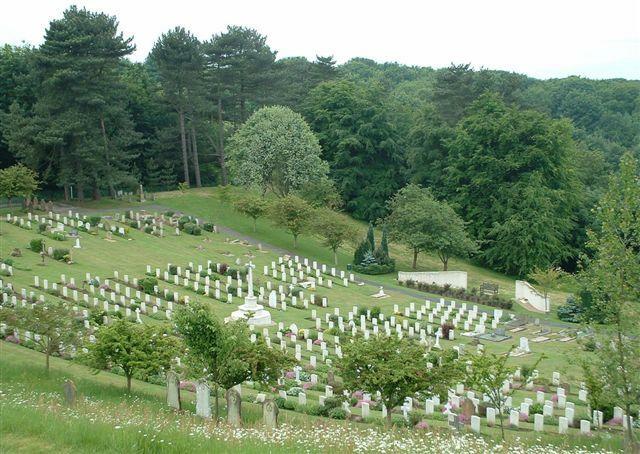 Lloyd was killed at Shorncliffe in Kent, England on the 25th May, 1917 and Mable was obviously there when he died. Below is a photgraph of Mabel, possibly with her mother, and a copy of the letter. St. Thomas, Ont., June 28th, 1917. Miss Mabel Jones, Shorncliife, Eng. Or rather I should say my dear Mabel for you seem so near to me at this time. Although I do not know you yet I feel that I am well aquainted with you. How am I going to be able to repay you for the kindnesses that you showed to our Lloyd in his lat minutes upon earth. You consoled our feelings more than any letter which we had received. It was a great surprise to us to learn that he was engaged for that was one of the few secrets which he from us. You certainly did what few girls would have done, that was to see that he was properly prepared for burial. It was one of the things that we couldn' t help thinking about. Despite all that we could do the thought would fly through our minds, if he died alone, how long he lived after he was struck and was their anyone near to hold his hand or give him the farewell kiss, the kiss that none other than the mother can give in the last seconds of life. The word came as a severe shock to us. We got the news on a Sunday afternoon. We were not all at home,in fact there was just my sister and baby brother with mother when she received the awful news. They sent after me and I simply refused to believe a word of it at first., but found upon arriving home that it was all too true. You asked for a picture of him. We have only one photo of him but have some snapshots taken at different times. There is one of him alone and one of he and his chum. I will send you one of each for some like the one and some the other, however I think they are both good of him. It must have been an awful sight to see all those men marching to the grave, and you are certainly a brave little girl go too. Really I can't express my thanks in words but just try and understand how much we all appreciate your many kindnesses. You may think it funny me answering this letter when you wrote to Mother, but I do nearly all the corresponding. Mother can't controll her feelings enough to write just yet. Only time will heal the awful wound his death has made. We are looking forward to the time when it will be possible for you to come to Canada for we surely want to see the girl who was so good to Lloyd. There is one thing I would like to know and that is was he afraid to die. We all feel sure that he was ready for he was always a lover of all that was good and true, but I would have loved to haved looked in his eyes once more before God took him home, but He did not will that I should. This is a very blue letter but you will have to forgive for I can't be cheery when writing of him. I can't send the pictures this week for they are not finished but will write you again next week and send them. Once more I am going to ask you to accept the humble thanks of myself, mother and father and all the family. Write to me often won't you please. Miss Hazel B Yeo, C/M.C.R. Dining Hall, St. Thomas, Ont., Can. Lloyd Garfield Yeo was born on the 27th September, 1898 to Thomas Yeo & his second wife, Susan (Elizabeth) Jenney. Father, Thomas emigrated to Canada in 1868 from Milton Damerel in Devon, with several other brothers. His parents were James Yeo & Elizabeth Braund. Thomas settled at St. Thomas, Ontario, where he was married twice. In the first family-- there were two boys and a girl: . William T. (a lawyer), James J. (an accountant) and Rhoda who married Judson McCarthy. Thomas second wife was Susan Jenney, and they had Frank, Hazel (1893-1984) who married Frank Darlington., Cora who married Arthur Withenshaw, Harold who died at young age of meningitis, Lloyd - killed in World War I, Bert and Clarence. Lloyd appears in both the 1901 & 1911 censuses for St Thomas, Ontario, living with his family. . His father Thomas was a school janitor in 1901 and a church sexton in 1911. Only 17 years of age, Lloyd enlisted on the 7th October, 1915 into the Canadian Mounted Police, B. Squadron Mounted Rifles. His enlistment papers, page 1 & page 2, describe him as 5ft 7" with a dark complexion, brown eyes but light coloured hair. His religion was Church of England and at the time of his enlistment he was living with his mother who he names as his next of kin, at 65 Southwick Pl., St Thomas, Ontario. By 1917 he was serving in the Canadian Reserve Cavalry Regiment, stationed at Shorncliffe Camp, near Folkstone Kent. He met Mabel and they had got engaged. However on the 25th May, 1917, a warm and Sunny late Spring day, an aeroplane circled overhead the town of Folkstone, but few were alarmed, as most thought it was 'one of ours' from Dover. There was a series of crashes in the distance but again it was thought to be gun practice from one of the army camps in the vicinity, So the people of Folkstone were taken completely by surprise when the Gotha planes swooped down on the town, dropping their load of high explosive bombs. Nearly 60 people were killed instantly, many others died later from their injuries and over 100 suffered wounds. For those who witnessed it, the carnage was so appalling it could never be forgotten. The total killed was 71, 16 men, 28 women and 27 children. Outside of Folkstone other bombs fell, 19 at Lympne, 19 at Hythem 2 at Sandgate, 16 at Cheriton and 18 at the military camps of St Martin's Plain, Dibgate and Shorncliffe. At Shorncliffe a total of 18 soldiers, 16 of whom were Canadians were killed and 90 wounded. Lloyd Garfield Yeo was one of those killed, just nineteen years of age and with such a promising future ahead of him. Reading through the letter, it is probable that poor Mabel was with him when he died and then organised his funeral. It must have been so heartbreaking for her. . The letter is full of the emotions and grief his family were suffering written by his older sister, Hazel, only weeks after his death. Poor Lloyd's mother was naturally devastated. Lloyd is buried in the Shorncliffe Military cemetry, alongside many other Canadians, such a waste of a young life which had hardly begun, but how brave he was and he will never be forgotten, as this letter has proved. Shirley would be delighted to hear from any relatives of Lloyd and I will put you in contact if you e-mail me. to Shirley Baker of Bognor Regis for sharing this letter and information with us. to Pete Wood member of the Canadian Expeditionary Force Research Group. At the bottom of this webpage, Pete has listed the names of the other Canadian soldiers killed in the air raid. There is also a link which shows the War Diary for that day, and lists the large number of killed and wounded. Pete can be contacted directly, via the CEF website..